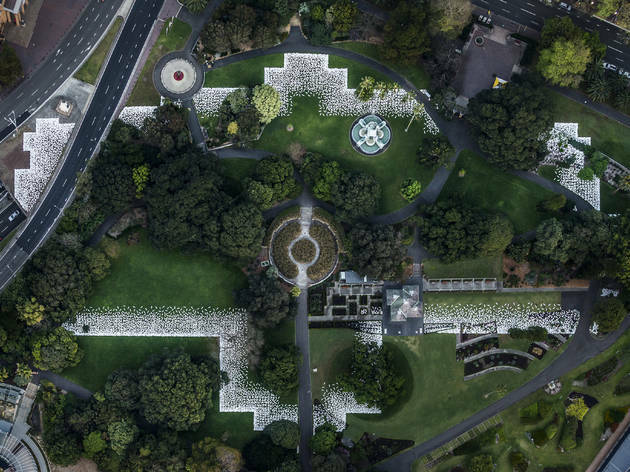 Kaldor Public Art Projects, with artist Jonathan Jones, have celebrated the 200th birthday of the Royal Botanic Gardens in Sydney with a thought-provoking, multi-dimensional project called Barrangal Dyara. In 1879 Sydney hosted the International Exhibition. A specially designed building was erected on the edges of the Botanic Gardens to house the exhibition. It was grandly called the Garden Palace. Tragically the Garden Palace and everything inside was destroyed by fire in 1882. Stored inside was a huge collection of Gadigal artefacts of cultural and historical significance. Over a hundred years later, Jones went searching for some of the cultural material from where his family came from. He discovered that most of it was destroyed in the Palace Garden fire. The sense of loss and forgetting around this event spurred Jones on to find a way to reconnect and understand what happened here.
" Perhaps the fire was a kind of cultural burn, regenerating the site for future generations." The project put together an information booklet for visitors. "as I've worked on the project, the garden palace has become a symbol for the repercussions of forgetting. 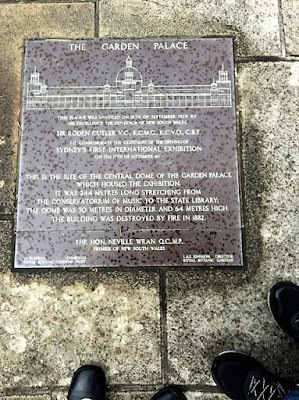 So many people I've spoken to about the project hadn't known the history of this enormous building that once dominated Sydney's skyline both physically and conceptually. I've begun to question what else we can forget as a community, if something so grand and visible and spoken about has disappeared from our vision. Aboriginal communities have often been the victims of Australia's ability to forget. In this way the Garden Palace became a fault line in the nation's memory, which has enabled the project to bring to the fore other forgotten histories." Barrangal dyara means 'skin and bones'. The project consisted of three components - a native meadow of kangaroo grass, thousands of white shields and several soundscapes. The four different types of shields marked the boundary of the original building. They also "echo the expansive rubble that remained after the fire." These shields are "void of unique markings or personal designs, speaking to the erasure of cultural complexities through collection." The exhibition ran from 17th Sept - 3rd Oct 2016. My first visit was three days before the official opening. The crew were still laying the finishes touches to the design. A week later, I returned to see what all the fuss was about. So I ducked into the State Library across the road instead. One of the exhibitions they had on that day featured some paintings from the era of the Garden Palace. It was obviously a dramatic, unforgettable event. When the rain cleared I tried again. It was difficult to take in the whole design. Strange angles jutted out, creating spaces that made it hard to see what was inside and what was outside. As I walked around the large space that was, once upon a time the Garden Palace, the soundscapes followed me. Eight language groups recorded words, songs and sayings to "reinstate contemporary Aboriginal voices into the landscape." It was a haunting, yet joyful experience. No matter how much I walked around the space though, my imagination could not take in the whole. Until I spotted the picture below in the newspaper a couple of days later. Finally I felt the full impact of the work! 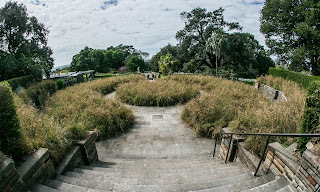 But I also realised that I had missed the third component - the kangaroo grasses in the very centre of the building where the dome rose up the skies. "Aboriginal agriculture in the south-east of Australia saw grasslands cultivated and harvested over generations, supporting many nations and diverse cultures. Seeds were transformed into flour to produce bread with grinding stones. Controlled fire was an important tool in the development of these grasslands, and here it acts as a dual metaphor." So I returned the following week with Mr Seasons to take in the whole thing - shields, voices and grass. If you'd like to learn more about this project as well as view some of the installation photos please visit their blog here. The aerial view does help! What an unusual exhibition! I can see why the vastness of the palace would be hard to take in, but the aerial view made it all clear. Sounds like a fascinating experience. This sounds like a very interesting exhibit. It's a shame that the records were lost but great that it lead to this. Oh I never heard of this exhibition at all! It is much too big to appreciate without the aerial shot isn't it? I'd vaguely heard of the Garden Palace before, such a shame it burnt down.